A $5 slice is not something we are particularly comfortable with. For a slice to justifiably cost that much money, it should probably either be topped with some kind of delicious and rare animal meat (panda? ), or be the last f*cking slice of pizza in the world. The $5 slice of pizza at Di Fara is neither of those things. But it is the best pizza in New York. It’s the ingredients and the care that set Di Fara apart from the rest, from the sweet and tangy sauce, to the imported cheese and olive oil, to the fresh basil that pizza maker Domenico DeMarco cuts himself. The wait time in this place regularly stretches into the two-hour territory because DeMarco inspects every pie, refusing to rush through the process just because you think you’ve got somewhere to be. You came here for pizza from the best, and you’re going to get pizza from the best, even if it takes all afternoon. If it’s the money you’re worried about, you can always just order yourself a whole pie ($28) and save a little bit of cost per slice. Or you could just pay the $5 and shut up about it. 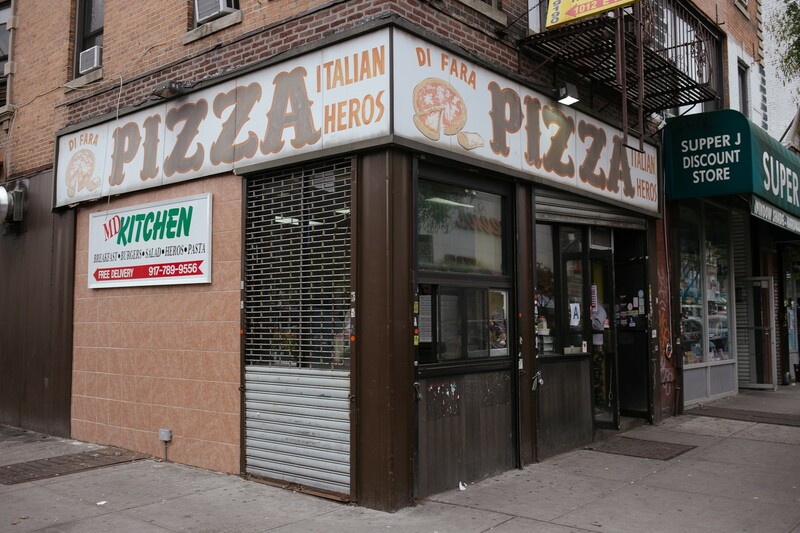 Either way, Di Fara knows it has this town by the balls. Midwood is not exactly what you’d call a gentrifying neighborhood, and the rents surely aren’t crazy this deep into Brooklyn. So what gives with the prices? The American dream, that’s what gives. DeMarco is well aware that he earned those lines that wrap around the block on a daily basis, and he seems intent on cashing in on it. And we couldn’t be happier to pay the asking price, no matter how high it rises. A flight to Naples costs a lot more - and there is no guarantee you’d even like the pizza over there any better. A few things to know before you set off on your Di Fara adventure: They’re closed Monday and Tuesday, they’re closed between 4:30 and 6:30pm every day, it’s cash only, you WILL wait at least an hour for your pie, and you WILL want to order another after you are done making love with the first. Plan accordingly. Pretty much heaven on earth, the thin crusted pizzas are served piping hot with just enough of the bottom burned for that coveted smoky crust. True to its Neapolitan roots, the middle is soft while the outside remains crispy. But remember you’re in New York, not Italy, so leave the knife and fork on the side. Throw in the deliciously sweet tomato sauce and the freshly grated Parmesan and basil and, well, just eat it and see for yourself. Oh, and do everybody a favor and do. not. blot. Call us and we will come out there and eat your oil-soaked napkins. We’re not above that. The same pizza dough folded over and stuffed to the gills with fresh, silky ricotta cheese and whatever topping you desire. Shaped perfectly, cooked perfectly, and topped with more of that oil and basil, this is simply and utterly amazing. Maybe second to Lucali’s version – but that’s a serious maaayyybe. The Farm on Adderley is a really good, comfortable restaurant in a neighborhood that seems to have relatively few of those. As anticipated, Kesté serves up some of the best pizza in town. Motorino isn't the best pizza in New York City, but it is one of our most frequented pizza joints in town.